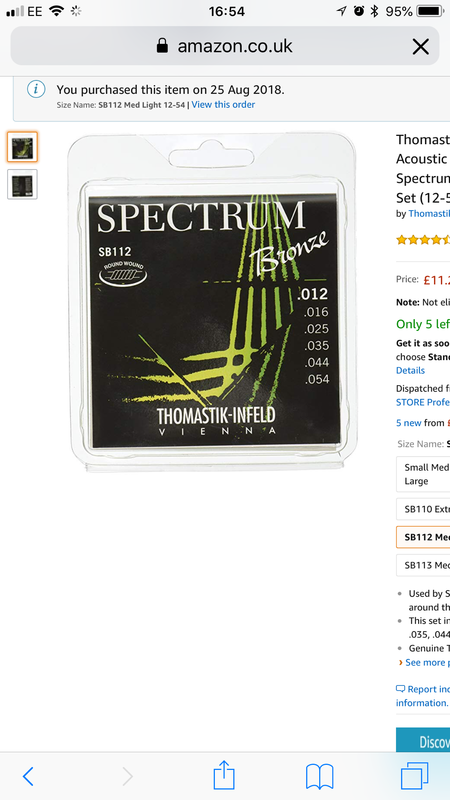 When did it get so expensive for strings? These elixirs are £15+++ ! I need to get some new strings. Seems to be no major conclusion from the thread and I don't want to try ten different sets. Yeah. The good news is elixirs last at least 3x as long as £5 strings, but I now realise they also sound poo, so more strings changes with cheaper strings seems to be a better bet. I reckon the Martin SP Lifespans are the best bet so far out of the ones I've tried. Medium price, medium life, decent sound. I reckon I don't want strings to last a whole year - I'd want to clean the guitar before then. I think I'm just going to stick with EJ16's - 3 pack for £21.... can't beat it. They're my second favourite to date (well, the 80/20 equivalent). - checked the sounds on YouTube, I'll stick with phosphor bronze. Phosphor Bronze tends to last longer in my experience as well. Bah, the EJ11 sound and feel rubbish after not-quite 6 weeks. They were great when new but dropped off quite fast and I don't like how they sound once they lose their edge. Martin SPs going back on tonight so I can see if I still like them 6 months after the last set. My daddario exp 12s didnt last too long. They sound nice but a bit thin, almost clanky. I've now moved to Martin lifespan 13s and my guitar sings! I'm back on the Lifespan 12's here and they're as good as I remember from last time. Not quite as toppy as the EJ11s were when new but an extra richness that the D'adds don't have. I've long been an elixir user. Yes, they remain shiny for quite a while. Shiny when the string is dead, or when the top wire has split/deformed along the g string and the last set I took off had a g string buzz on every fret. Very weird. I've now got a set of gabriel tenorio hand wound round wound strings. They're a bit more than elixirs, but tonally richer with more sustain and overtones. a lot of the 'string making companies' in the uas get their component wire - core + wrap from Stapes (sp?) Music Wire in Tennessee or the like - they're offered in various formulas AND qualities which is reflected in the price at the counter - typical £5a set are produced to a cost that will sell to the average player, playing a £200 to £1k guitar. Just put in Martin SP 13s. Wow. Loud. Not settled in yet - very bright. But I’m digging the oomph they bring. Did the same recently. I guess you saw them on offer at Amazon too. for some reason, they sound like crap on my taylor....and sound great on D28..like they designed them for their own guitars. So ended up using EXP16 (light coated ones) on taylor..
it would be tricky to make a string that works for all shapes and wood types of martins alone. Acoustics are a kit more sensitive than electric guitars, its very tricky business. I'm not convinced about them - too bright for the guitar they are currently on. I can see that on the RIGHT guitar played in a certain way they could be awesome as they really are very ballsy. But failing that, give them a couple of weeks to bed in. I find they lose that initial major brightness relatively quickly but kept a rally nice mellow tone for a long time after that. Still brighter and nicer than phosphors just a little less toppy than new. Thanks Sticky. I will give them a little longer. I’ve just restrung my Takamine with Martin Retro’s. They work really well, nice full mellow tone from them. The Tak tends to be very bright and too zingy with phosphor bronze strings, these suit it much better. Wish I’d gone gone for 13s (or heavier), I bought 12s and the top strings feel like cotton. A while ago I tried Retros on a mahogany OM. Hated them. Tinny, thin, awful. Came straight off. Didn't last 24 hours. that would suggest to me your guitar likes the tension 13 afford ???. Yes, the SP 13s are on a Martin OM21. Seem to really go together. I got these for my 64 D-28 but not fitted them yet. Anyone used them? I've replaced the Newtones on my Guild 12 fret with Martin Retros. I went back to 13s after a failed experiment with 12s and am quite impressed with them. I agree with the marketing spiel - you really do hear less string and more guitar. My guitar is already very mellow and these strings really emphasise that. Maybe a bit too little zing although its still there if you really dig in - forces me to play a bit differently but they do sound good. Sounds way better tuned down a half step - guitar felt a bit choked at standard pitch. Bizarrely the strings seem a bit brighter now that they have been on the guitar for a couple of weeks although that might be a trick of the ears due to me getting used to the difference. yeah tried them a coupe o' times very well made - poss THE best - not surprising given their history - the just dont skimp on materials or construction. Sound wise they are VERY full and round and 'mellow' quickly to that 'play'd in sound - should go well with a D28. One thing to watch out for is the silk wrap around the ball end winding, it may be a squeeze - easily dealt with a sharp blade slices the thread of, I tried to put them through Lowdens string through bridge - rh no. Last thing is - because the bronze wrap wire is v/high quality ir dont like devil sweat - no life extending zinc in then but the + is they dont have that brittle metallic timbre sound u get from £5 a set sets. Great stuff thanks mate. Look forward to getting them on now. Jumped on to this thread to see if I could get a definitive answer on what I should be looking at to stop my Martin 0001xae sounding so muddy (on elixirs) but it's confused me further! I've not really gelled with the guitar but I think I should try some different strings before I flip it.